Led by the Grim Reaper! Bunch of liberal losers. Ugly no brainers. It is not called the demonic Democrat Party for nothing! As soon as i see the list of whom all that is doing this, i will immediately purge their movies from my collection. AND BLACK LIST THEM From ever seeing a movie of theirs again. 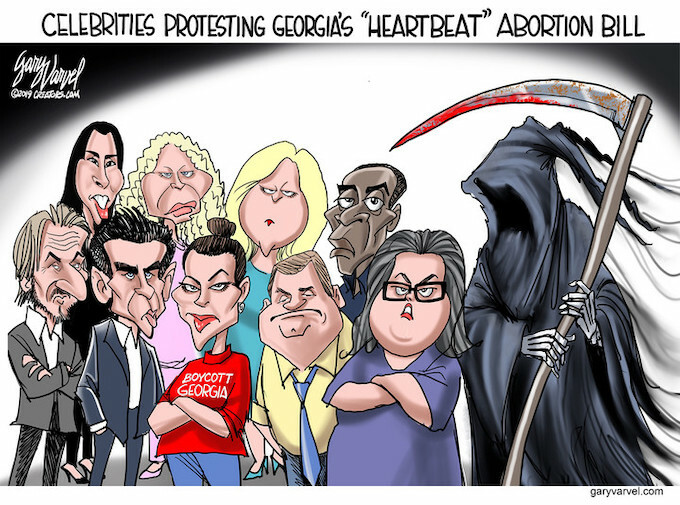 Democrats – the Party of Death. Dems celebrate death continually. Of course this means they must be against the death penalty for criminals (but not for babies). If criminals get a free pass then they might get out of prison one day and kill more people. It’s called recidivism. And Dems want as much of that as possible, so as many innocent people as possible can be killed. I claim total ignorance. Except for the guy in the hood I don’t now who any of those people are. Is that a good thing or a bad thing? The guy with the hood is named Archie, by the way. From another site i see the following names of those signing onto Allysa Millano’s boycott call. Debra Messing, Sean Penn. Don’t really pay attention to either of these 2..
Amy Schumer, Alec Baldwin and Judd Apatow. Haven’t paid attention to these 3 for years.. ESPECIALLY baldwin. Others are Rosie O’Donnell, Gabrielle Union Patton Oswalt, Ben Stiller, Sarah Silverman, Mia Farrow, Essence Atkins, Uzo Aduba, and Christina Applegate.. Stiller’s the only one there i pay attention to.. Guess he’s getting added to my list.